Here's to Hope - Dangergirl Lives! My current biggest hope, and third biggest love, is Ricardo. He’s my Hope this summer. Ricardo has big shoes to fill, I’m hoping that at least he surpasses Fiona, she was the largest pumpkin I’ve ever grown. Fiona was maybe 100 pounds and suffered from “lifus interuptess”. If you want to know her story please read this blog post. I have high hopes for Ricardo, and it’s my first giant with a boy’s name. We’ll just have to see how that goes. I planted two different giant pumpkin seeds in his hill. I’m not sure of his variety, and he was a slow starter. But boy am I on his team now. Uh, oh, you can’t really see him in the picture? Look below. There he is. He’s such a new baby. He’s about the size of a lemon right now. I’m assuming he’s fertilized, his flower went away awfully fast, and we’re having a plethora of bees in the garden right now. Ricardo also has some friends/followers. In case I mention them again, you should know that they are Fred, Ethel and Lucy! Those ones are all jack o’ lanterns, although I challenge them to grow large and in charge. They have also taken off like crazy and amongst them, they have five babies so far. Hooray! I can’t tell whose they are because their vines are all tangled up. Fred, Ethel and Lucy. Ricardo is on the back right hand side.I’m going to let Fred, Ethel and Lucy keep all of their babies. Sadly for Ricardo, he is an only child. If anyone needs a pumpkin come halloween, you are welcome to visit my patch. Anything can happen, and it always does with the giant pumpkin. 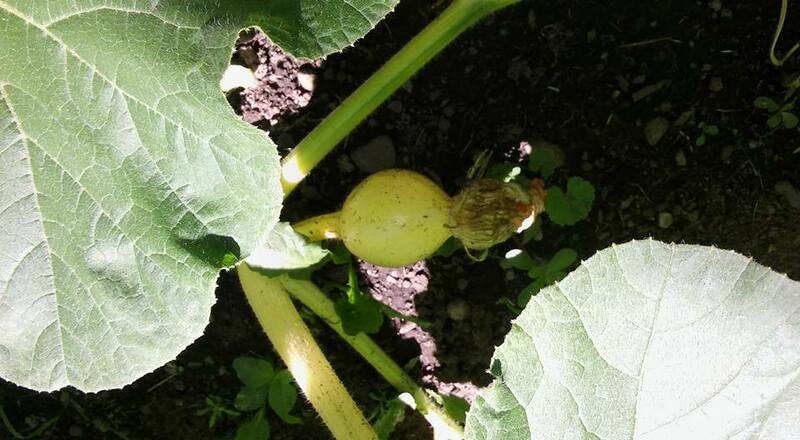 There was the weed eater accident, Sprinkler (the man, not the machine) breaking one near her stem, and last year, the most crazy of all happenings, my giant pumpkins literally blew up. Their insides grew faster than their outsides and day after day I would find them blowing out their heads or their butts. Sigh. I have hope for Ricardo. Isn’t Hope funny? Hope is a very important emotion, it keeps us all going in one way or another, everyday. Hope trumps Love, Hate, Anger and Sadness. Hope obliterates Worry. Hope drives Anticipation. And the best part about Hope is you can have Hope in anything. Even a giant pumpkin. Oh, he’s a dashing young pumpkin! Grow, Ricardo, grow! Your right about hope……it’s a must have in life or all will be lost (literally). I love to mix the three Faith, Hope and Love – – In many ways your garden depicts the old saying “You reap what you sow” nowadays folks call it Karma but it began with agriculture. Even though the pumpkins may survive or explode – your trying to produce something wonderful and amazing. You sow into people’s spirits with your friendship, amazing personality and generosity. Here’s to a successful harvest!